It took three full hours on Sunday afternoon, but the Buffalo Bills finally produced the moment of gut-wrenching anxiety their fans have come to expect—anticipate, even, over the past two decades. The Dolphins, who had cut Buffalo’s game-long lead to eight points, would get a chance to wipe it out completely. Bill, an excellent sidekick on the We Want Marangi coverage team, looked a bit anxious for the first time since Tyrod Taylor’s nine-yard touchdown run gave the Bills a 15-point lead more than two quarters and almost two hours earlier. Joey, who had just replaced Nick as our host at Gypsy Parlor on Grant Street, spun behind the bar and looked at me with the spooked eyes of a man who had seen this movie far too many times. “It is not fine,” he said. Of course, Joey was right. The Dolphins were 63 yards and a two-point conversion from forcing overtime. There were 37 seconds left, enough time for four or five plays. Enough time for a Jay Cutler pass to ricochet off the hands of a Bills defender into those of a receiver streaking down the sideline. Or for one of those defenders to fall down for no apparent reason. Or a horrible defensive pass-interference call in the end zone. Or some combination of the above. 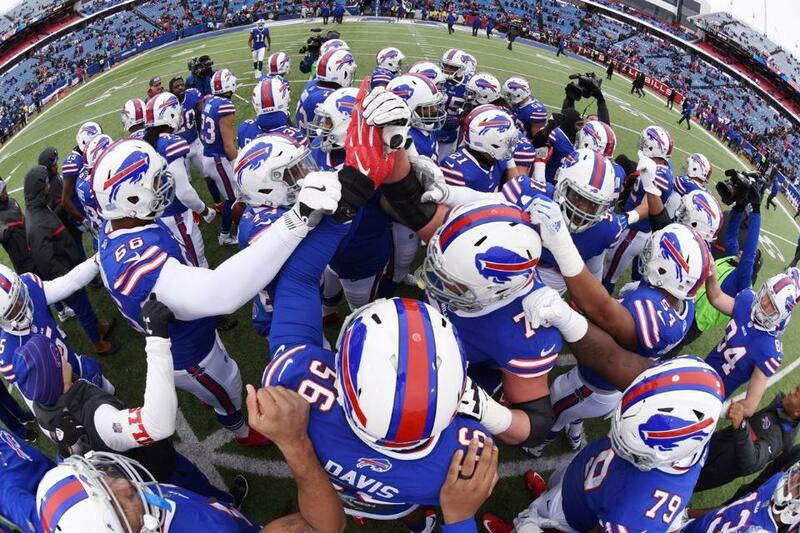 Since they last reached the NFL playoffs following the 1999 season, such soul-shredding losses have become the identifying feature of Buffalo Bills football in the 21st century. Fortunately, this time, Jay Cutler was involved. On the first snap, the least-interested-looking quarterback in league history flung his third interception of the day, this one to rookie-of-the-year candidate Tre’Davious White. Taylor took a knee—in the sense that is okay with all of America—and realistic hopes of ending the franchise’s 17 years of wandering in postseason exile stayed alive. Buffalo had spent the first three quarters looking decidedly un-Billsy. Taylor guided the offense down the field on the opening drive, capped by LeSean McCoy’s scoring run. The defense gave up some chunks of yardage early, but held Miami to a pair of field goals. Taylor, who had been benched and injured in the previous month, flustered Miami’s pass rush with his mobility and found open receivers to keep drives going. McCoy ripped off several big runs, as well as returning one play after leaving with what looked to be a potentially serious injury to catch a 16-yard pass from Taylor for Buffalo’s second touchdown. And Taylor capped the first-half surge by scrambling for another score, showing the sort of body control and field awareness that made you wonder, once again, what Sean McDermott was thinking when he switched to Nathan Peterman in the first place. But since the first-year coach has been shredded elsewhere for putting the rookie quarterback in such an obvious position to fail, as has Peterman for doing just that in such spectacular fashion, we will move on. The Bills went into their usual shell after Steven Hauschka’s field goal pushed the margin to 18 in the third quarter, while the gathering at Gypsy Parlor turned its attention to other topics. The steady stream of classic soul and R&B flowing out of the speakers, mercifully sparing us from the commentary of the network announcers, further enhanced the mood. Who can really get too stressed while “Papa Was A Rolling Stone,” “You Send Me,” “What’s Going On,” and “We’ll Be Together” are playing? For their part, the Bills seemed content to just let the damn clock run out already, particularly on offense. That approach always seems to backfire. It very nearly did this time. A long Miami punt return lengthened further by a horse-collar penalty on Buffalo set up a point-blank touchdown. Buffalo moved into field-goal range, but McCoy got stuffed on third-and-two, putting them back in punting range under the circumstances. Still, the Bills led by 11 when the Dolphins got the ball at their own 14-yard line with 4:33 remaining. Miami’s ensuing 17-play possession proved a flashback of the Colts’ game-tying 19-play drive a week earlier, only with Cutler in place of Indy’s Jacoby Brissett and without a foot of snow blanketing New Era Field. There was even a fourth-and-long, which Cutler—who has spent a long, inglorious career showing he can make every throw except the ones his team needs the most—coming through in the clutch. That helped Miami get into position for a field goal, which set up the near-Doomsday ending described above. Instead of a disastrous defeat, though, Buffalo heads to New England at 8-6, tied with the Ravens and Titans in the wild-card race. The Chargers (beneficiary of McDermott’s tactical blunder and Peterman’s five first-half interceptions) lurking a game back, head-to-head tiebreaker in hand. To beat New England on the road would require the Bills to put together a performance unlike any they have produced in, oh, at least 18 years. Especially since the game is important to the Patriots’ playoff positioning, meaning Tom Brady will play the whole game. Buffalo has beaten New England exactly twice under such circumstances since 2001. There are scenarios under which Buffalo could still qualify by beating Miami, again on the road, on New Year’s Eve. But just reading Joe Buscaglia’s thorough breakdown at wkbw.com, much less trying to summarize it, kind of makes my brain feel like exploding. During the stress-free portion of Sunday’s game, Bill and I considered ordering from Gypsy Parlor’s eclectic brunch menu, which involves a variety of egg dishes and ethnic selections. Instead, we went with the wings. We are in Buffalo, for God’s sake, we figured. Let’s live the cliché. For one Sunday, at least, the city’s football team did not.